The original Chinese opera Marco Polo, based on the story of the Venetian explorer who traveled along the ancient Silk Road in the 13th century, will be staged in September at the Teatro Carlo Felice in Genoa, Italy, and then go on tour in Italy. Composed and written in Chinese and performed by Western and Chinese singers, the work is the first original Chinese opera produced by Guangzhou Opera House for the Silk Road International League of Theaters, which was initiated by the China Arts and Entertainment Group in 2016. The league - representing 107 members from 37 countries and regions - serves as a platform for the performing arts and was set up to promote cultural exchanges between China and other countries. Two of the league's members are from Italy, Teatro Carlo Felice in Genoa and Teatro La Fenice in Venice, said Li Jinsheng, president of the China Arts and Entertainment Group. "The process of making this opera, Marco Polo, has been a major effort of communication. The Venetian explorer is seen as a symbol of friendship," Li said in Rome on Friday. Li announced the opera's Italian tour and signed an agreement for its Italian premiere this September, with Giuseppe Acquaviva, artistic director of Teatro Carlo Felice. Kasper Holten, a Dane who was director of opera at the Royal Opera House in London from 2011 to 2017 and is currently vice-president of the European Academy of Music Theatre, is Marco Polo's director. As it relates the story of Marco, the opera also revolves around two other Italian adventurers, Niccolo and Maffeo Polo, Marco's father and uncle. It also portrays the romance between Marco and a young Chinese woman named Chuan Yun, as well as the rise and fall of the Song and Yuan dynasties (960-1368). 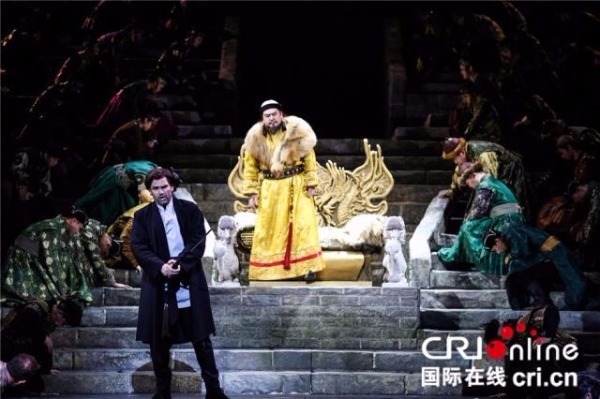 Marco Polo had its world premiere at the Guangzhou Opera House on May 4, 2018, with the Macao Symphony Orchestra performing under the baton of Tang Muhai, one of China's most acclaimed conductors. Danish tenor Peter Lodahl sang the leading role. "I speak six languages and have sung in 10 languages, but I had never sung in Chinese," said Lodahl, who was in Beijing when the opera was staged at Tianqiao Performing Arts Center from May 16 to 19 last year. "Then I decided to give it a try. And I'm looking forward to singing in more Chinese operas." According to Li, the opera took about three years to put together with a team of international artists. Among them was Munich-based composer Enjott Schneider, who wrote the music for the three-hour opera in 10 weeks. The libretto was written by Wei Jin, one of the most influential poets in contemporary Chinese literature. The composer combined traditional Chinese folk elements with Mongolian music and Western classical music. Chinese musical instruments, including the erhu (a bowed two-stringed instrument), yangqin (a Chinese dulcimer) and bamboo flute, as well as khoomei (traditional Mongolian throat-singing), all can be heard set against the backdrop of the symphony orchestra. "Marco Polo is a sign for connecting cultures. Besides the significance of composing completely for a Chinese opera, I believe that the opera delivers something more, that is, love and peace," the composer said in Beijing in May. The original Chinese opera Marco Polo will be staged in September at the Teatro Carlo Felice in Genoa, Italy, and then go on tour in Italy.